My colleague Ioannis recently blogged and recorded a video of using Fuse Fabric with Apache Camel. Fuse Fabric is the open source project that we have been hacking on for the last year. Its coming all well together. And the upcoming 1.2 release is well on the way. When its GA you will hear more from us about it. The project is hosted at github and its a 100% ASL licensed project, so its very business friendly, and everybody can use it, fork it, embed it in your products, or whatever. Fuse Fabric is a distributed configuration, management and provisioning system for Apache Karaf based containers such as Apache ServiceMix and Fuse ESB. Installing and managing containers to your private or public cloud. Deployment agent for configuring and provisioning distributed containers. Discovery of Camel endpoints & message brokers. Use a single host for installing containers to your local network. Deploy and configure applications to distributed containers. Discover & use message brokers in your camel routes. You will get a chance to see and hear more about Fuse Fabric, Apache Camel, ActiveMQ Apollo, et all at the upcoming CamelOne conference, which takes place in May 2012. I have previously blogged about this conference here. 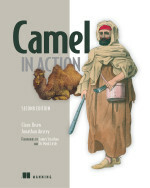 Hope to see you at CamelOne.